If you’re an IT professional, last week you probably were feeling pretty good about your mobile strategy. You knew which platforms you were supporting, and it was all good. Then it all blew up this week and all your careful plans with it, in a string of moves which illustrates just how quickly the mobile landscape can change. The big news of course broke this morning when Nokia announced it was abandoning Symbian and MeeGo and going full bore with Microsoft Windows Phone 7. In case you’re wondering, yes, that was Steve Ballmer you saw doing a Happy Dance because his mobile OS just got a huge boost. In one stroke of the pen (so to speak), Nokia CEO Stephen Elop suddenly made Windows Phone 7 a major mobile player and majorly screwed anyone who had made big plans for Symbian or MeeGo. Oh, and he had your team scrambling to figure out if this was going to have a major impact on that carefully planned mobile strategy of yours. Let’s not forget folks, as I wrote in my post on Wednesday, Looks Like You Might Not Have to Support Symbian, IDC reported that Nokia shipped 5 million phones last quarter. That was still good enough for first place in mobile phone shipments, but it apparently wasn’t enough for Elop. He saw a fading North American market, and no sustainability. And of course, Nokia won’t just go from Symbian to Windows Phone 7 over night, there will be a period of transition, which could make things even more interesting for you. Meanwhile, Verizon launched the iPhone this week and a survey of existing Verizon customers suggested that folks using RIM and Android phones want to switch to an iPhone in a bad way, and will jump as soon as they get the chance. Again, you have to be wondering what impact this is going to have on your IT strategy. It’s all enough for an IT pro to throw up his/her arms in despair. How this news will affect your company’s mobile approach moving forward? Will a Nokia-Microsoft partnership change the market dynamics? 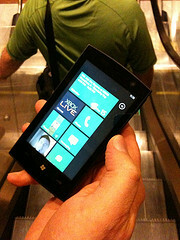 Will Europeans, who buy Nokia phones in large numbers, embrace a Windows mobile OS? And if you’ve been supporting Symbian what does it mean for that aspect of your business moving forward? There are no simple answers to any of these questions and you have to watch the market shifts with the rest of us to see what happens. It could be that what we witnessed this week was much ado about nothing, but it also could be the week everything changed in the mobile marketplace. Unfortunately, there is no way to know for now and that has to be making you a little crazy as you look for ways to define a concrete mobile approach at your organization. Photo by jeffwilcox on Flickr. Used under Creative Commons License.